The SSO domain is used when setting HTTP authentication cookies in a user's browser. If this attribute is not correct, single sign-on (SSO) will not work when the user switches between applications. 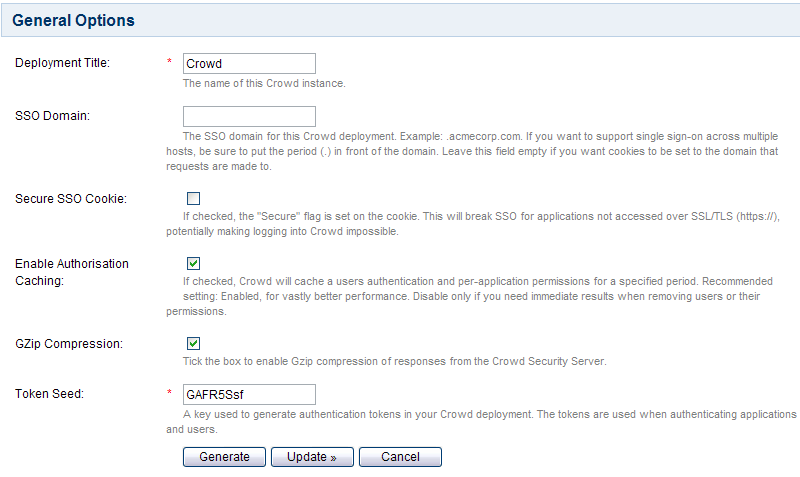 The core Crowd functionality supports SSO across applications within a single domain, such as *.mydomain.com. Crowd uses a browser cookie to manage SSO. Because your browser limits cookie access to hosts in the same domain, this means that all applications participating in SSO must be in the same domain. You can find information the comparison of host name strings in RFC 6265 (section 5). When developing on your local machine, you should set the domain to localhost. The 'General Options' screen will appear. Type the new domain into the 'SSO Domain' field. <Connector acceptCount="100" connectionTimeout="20000" disableUploadTimeout="true" enableLookups="false"
Avoiding problems with old cookie versions. In order to avoid problems with hosts or domains defined in old cookie versions, after setting the SSO Domain in Crowd, log out of Crowd and the integrated applications and delete all the web browser cookies. If you enter any other value, Crowd will show an error message: The supplied domain is invalid. IP addresses. SSO will not operate when sites are accessed using IP addresses rather than domain names. This is a limitation of the cookie technology implemented in web browsers.